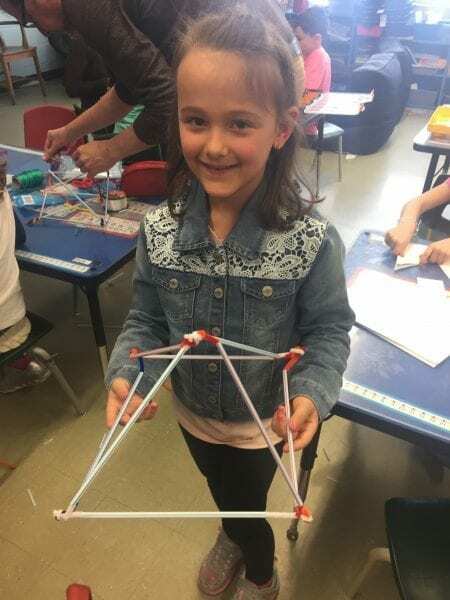 A few weeks ago, Chris Colley and I were at Edgewater Elementary School (LBPSB) to try our hand at Making with our youngest group ever – Grade One. Since the last school year, we have visited over two dozen classrooms, and have held just over 10 Open Creative Space days at our offices or on the road, working with both teachers and students on the Maker Mindset through hands-on making. You can read about it here and here. We’ve been mainly aiming at the middle, that grade 5-6 sweet spot where maturity and flexible scheduling meet in the perfect learning storm. But we’ve been curious about 1) how our STEAM challenges would scale up or down, 2) how long it would take grade one students to complete each challenge and whether they had the requisite attention span and 3) how they handled some of the more complex materials. Pascale Quenneville’s Grade One students were excited to being “doing Science”, as they phrased it. They were also used to working through stations, so we decided to use their existing class structure during the challenges. This was familiar to them and made transitions even more seamless than in older grades, and freed us up to focus on getting the challenge tables ready for the next group. Each student was able to complete three challenges over the course of the half-day we spent with them. I’ve divided the stations using a Plus-Minus-Interesting reflection model. In terms of sheer learning joy, the two clear winners were the Art-bot and the Claymation challenges. We felt good about these challenges for the age group and were proved right. 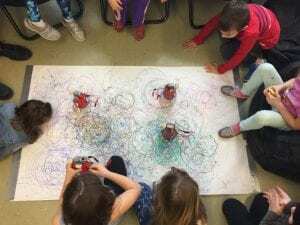 At the Art-bot station, grade one students were able to work in pairs to power a small motor using a battery and alligator cables, to affix the motor and battery to a cup and to attach markers to the cup. The students struggled somewhat with the fine motor skills required to affix the alligator clip to the tiny prongs of the motor, so we gave them a break and cut their duct tape for them. Judicious scaffolding. The testing phase was full of squeals and questions such as “Why doesn’t my robot move as fast as their robot?” and ‘How come the blue marker isn’t touching the paper?”. On the surface, the pinwheel challenge seemed a shoo-in for Cycle 1. However, we forgot about the straight pin that needs to go through the paper and into the wooden dowel, making this challenge impossible for grade 1 students to complete on their own. Creating a square out of a rectangular piece of paper and then cutting only part of the way along a line were also aspects of the pinwheel challenge that required serious adult intervention. After the first round of students, we switched to using pencils instead of dowels, and sticking the straight pin into the eraser part. This was easier, but still out of reach for grade 1. This challenge would be best done as a multi-age challenge where older students create the pinwheel and Cycle 1 students participate in the testing phase with a fan. Another challenge that we felt good about for grade 1 was creating straw solids, using pipe cleaners. When we heard that Pascale’s grade 1 students had done solids earlier in the school year, we were even more confident. It turns out that threading pipe cleaners through straws, and twisting them together to form the solid was somewhat out of reach for a majority of students. 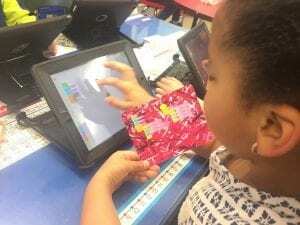 It was another station at which adult intervention was required to a degree that made the challenge both uninspiring for some students, and inappropriate for our goal of having kids engage fully in the act of making. One of our newer challenges is one where students choose a card and have to build something with Lego according to the design constraint identified. An example of a design constraint is “build something that is very tall and stands alone” or “build something that moves”. It was interesting to note that the boys in Pascale’s class were highly motivated to complete this challenge, even when they didn’t exactly know what to do. In the future, we will be trying to frame the design challenge questions in various ways to see if any resonate more with girls. We were also unsure if grade one students would be able to do basic programming with Turtle Art on the iPad. After some back and forth, Chris went through the programming cards and chose the simplest ones, with the simplest series of commands. After a brief intro, the kids were off and running, with very minimal adult intervention. Overall, our first foray into engaging Cycle 1 kids in Maker activities was very successful, with both teacher and students full of enthusiasm and plans for the future. Pascale Quenneville suggested that her school create a continuum for maker skills and attitudes, so that kids in grade one would be already developing competencies needed for more complex making in Cycle 3. We have seen Cycle 3 students be extremely capable when faced with our pre-planned open-ended Maker challenges. The ultimate goal, however, is for those students to have the competencies necessary for their own projects. Starting as early as Cycle 1 would mean that by the time students hit Cycle 3, they would be familiar with the practical (not just theoretical) notions of circuits, of simple machines, of building, of planning, of trial and error, of perseverance. That’s the dream. 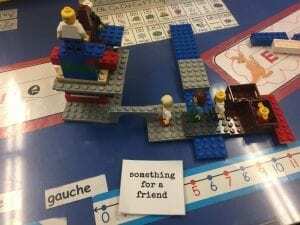 Great article Sylwia… I really enjoyed our time with grade 1 – We thought they would struggle, but in reality it was our own struggle in simply letting go and give the students space to make. Wow!